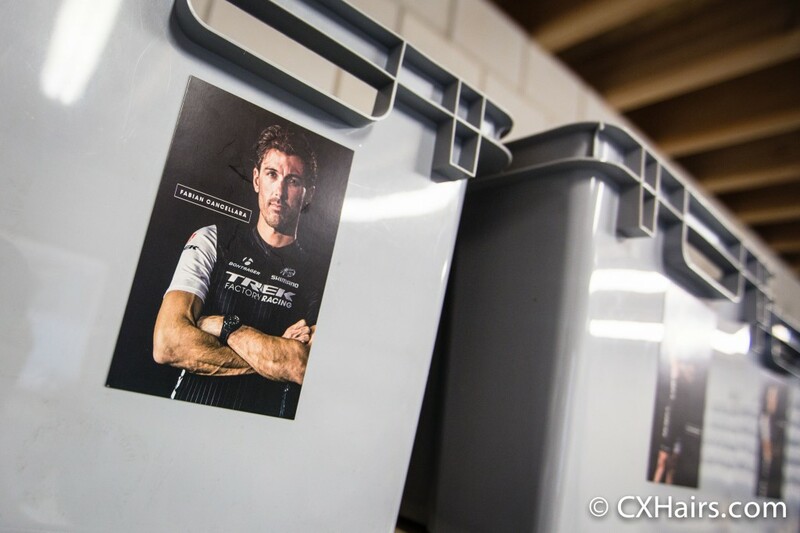 The Trek Factory Racing service course opened in November 2013 in a nondescript semi-industrial area of Deinze, Belgium, which is 20 minutes west of Gent and an easy drive to most of the spring classics. Freddie Stouffer, TFR Operations Manager, gave us a tour of the service course on the Tuesday between the cobbled classics, Ronde Van Vlaanderen and Paris-Roubaix. Dan Tille and Rusty Williford of Fulcrum Coaching joined me and did a great job grilling Stouffer on the inter-workings of the service course while I took photos and tried not to break anything. Absent the team car parked outside, you would have no idea the TFR service course was here. 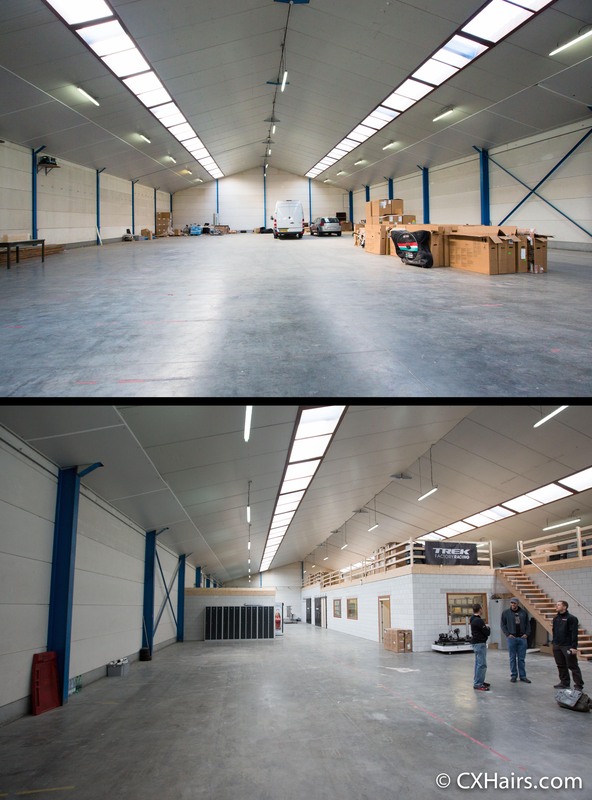 The owner of the building, who like most in Belgium is a huge cycling fan, allowed the Trek staff to design and build out the inside of the warehouse space to their liking. Since they have only done new construction to half of the facility, we get a good look of the before and after. The top image is unfinished warehouse and where the team vehicles are housed. The bottom is the built out service course with rooms for bikes, soft goods, food, a wash station and showers. The soft goods room has all of the shoes, kits, helmets and casual clothing. It’s basically a big closet. The bins are there to restock riders with kits and necessary items. If a rider crashes and rips a kit, the service course gets an email from the soigneurs indicating what is needed and the new items are made available in the rider’s personalized bin. “It’s like our own post office,” Stouffer explained. 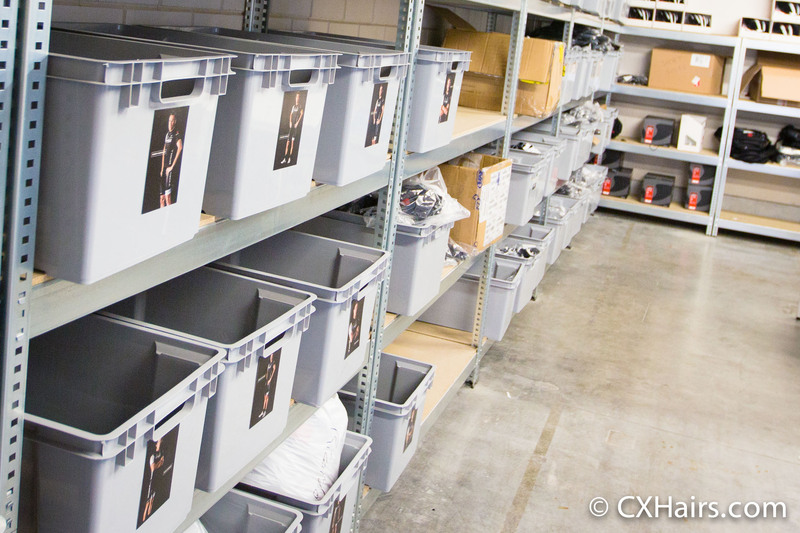 When new kit comes in, or when a rider needs a piece of clothing, it is kept here. Bin contents are then loaded into race vehicles. By owning the team and taking everything on from the ground up, clothing, shoes and helmets are constantly being tweaked. 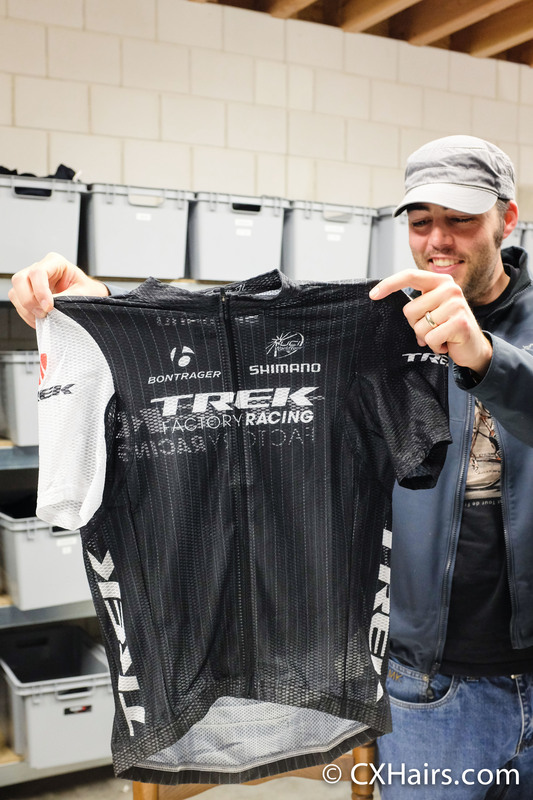 Having the riders showcase the gear first gives the Bontrager team a good idea about what they want to bring to market. 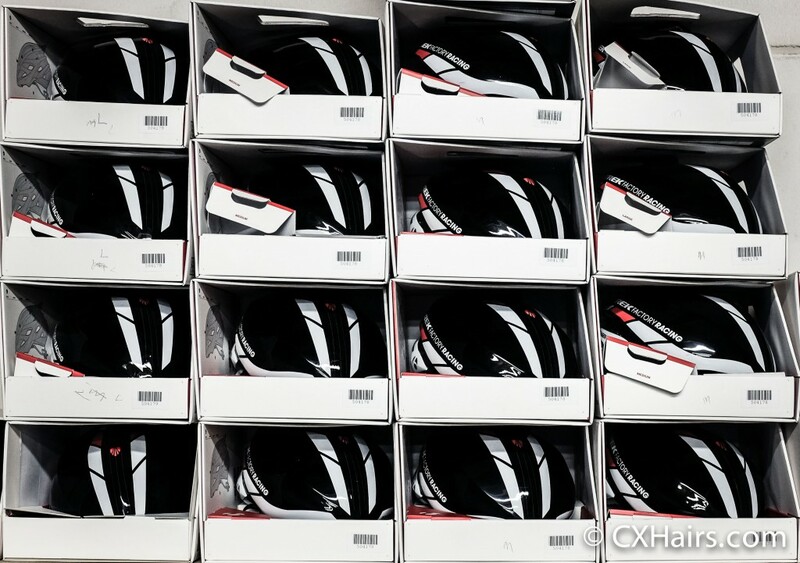 For instance, the Bontrager all-weather helmet has garnered a lot of interest from dealers. 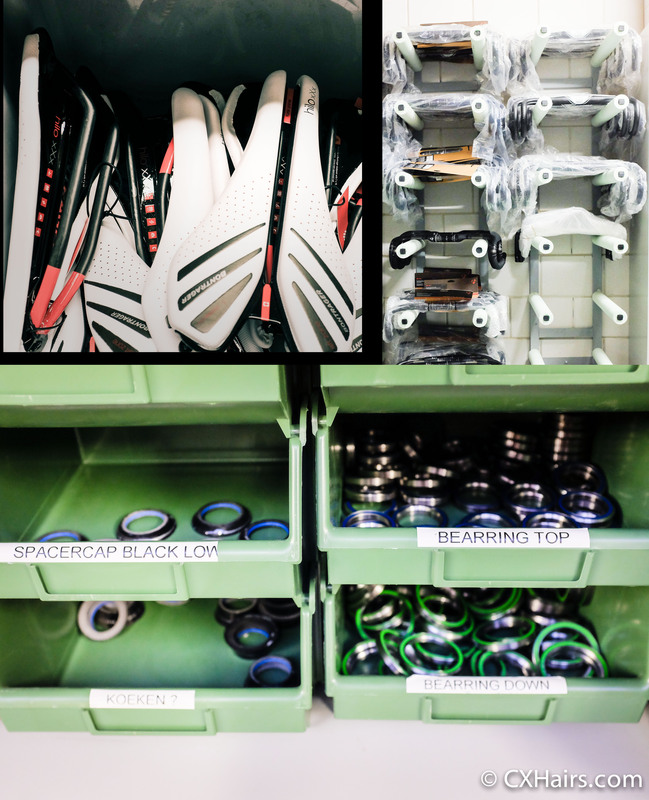 Using the team to help design high-end race products is something Bontrager is using to their advantage as they begin to manufacture more race-worthy products in-house. A small selection of the wall of Velocis AW helmets on hand in the soft goods room of the service course. The summer lightweight jersey is a popular item among riders and one that definitely needs to be worn while slathered in sunscreen. “It looks like something that came out of the lingerie department,” Stouffer said. Regardless, he added that the riders love it. Especially those who raced in the heat at the Tour Down Under earlier this year. Dan searched for the 6’5″ TFR jersey bin but came up short. Literally. TFR installed showers in the location for staff to use when they are returning bikes and gear after races. The location also has an indoor/outdoor bike washing area with a hot water power washer, something Stouffer said Mark Legg was pretty stoked about. Most likely, Katie Compton, who races for the Trek Cyclocross Collective, will be getting some bike cleaning done at the service course next season. The bike wash area covers an entire corner of the service course and continues on to a large concrete slab on the outside of the building for even more space for bikes to be cleaned. 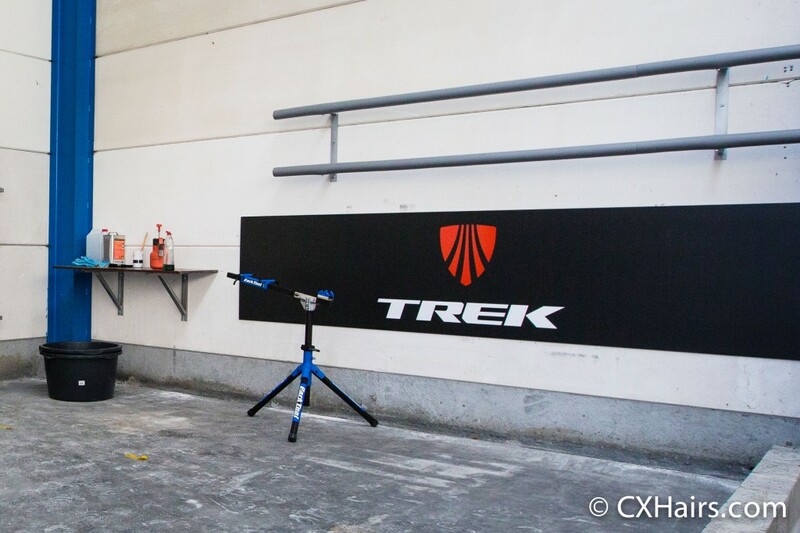 The location doesn’t have beds for overnight stays but it does have a handful of Trek commuter bikes that get used to travel from the location to the hotel the team uses a kilometer or so away. TFR also has a couple Trek electric bikes that are frequently being used by the neighbors who in return let the service course use their forklift. Evidently the electric bikes were used to get those neighbors quickly around the Ronde course for better spectating opportunities. Hotel shuttle on call 24/7. The components room. 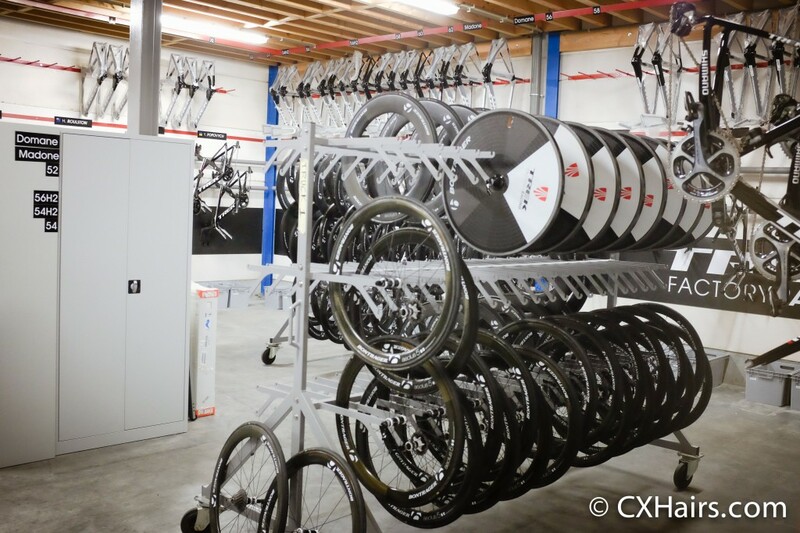 As full of Di2 and other top-end componentry as it is, the room is actually only about half full since the mechanics loaded up two trucks to build up a fleet of bikes for Roubaix. For that race, the team leaders—Fabian Cancellara and Stijn Devolder—will each have three bikes and the rest of the team members will have two bikes. 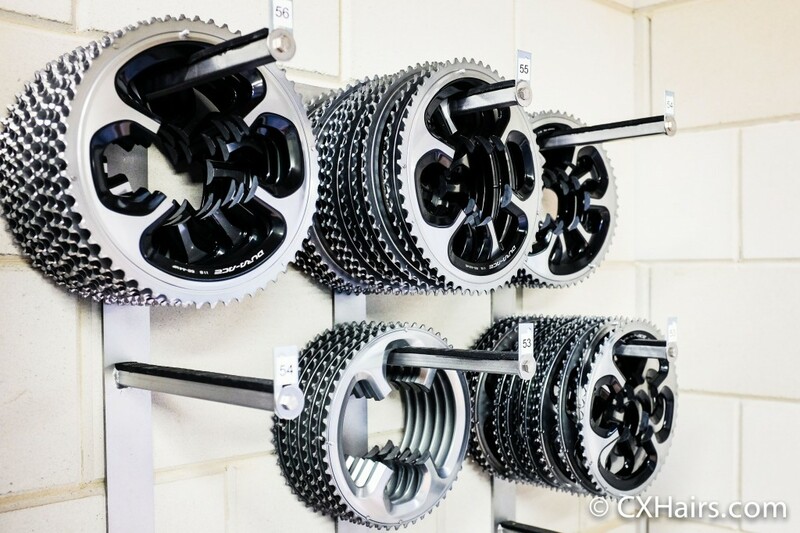 Spare chainrings, shifters, cables, and everything else must be available in bulk to meet the demands of racing at the top level. 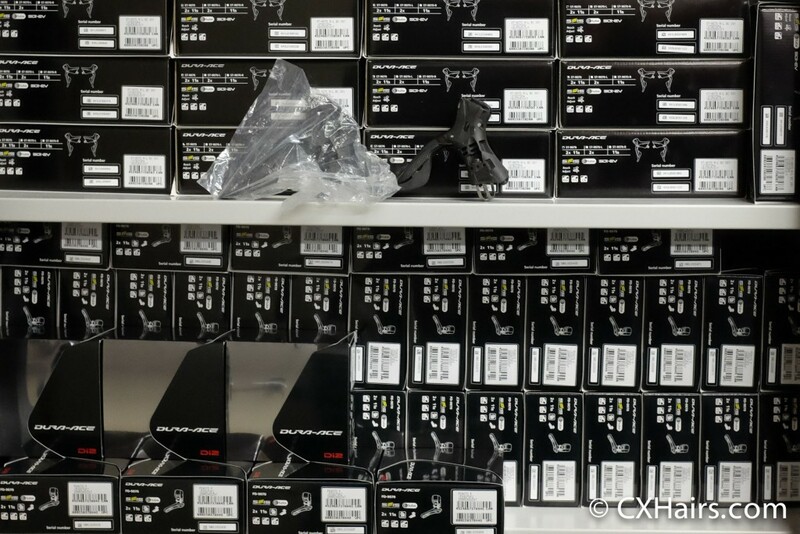 Di2 many sets to even count. During the Paris-Roubaix sportive I overheard a guy telling his friend that Dura Ace chainrings were not made larger than 54 tooth. I can safely say he was incorrect. The bike room. With the Ronde, Roubaix and Tour of the Basque all happening when we were at the site, the number of bikes was a little lower than usual. 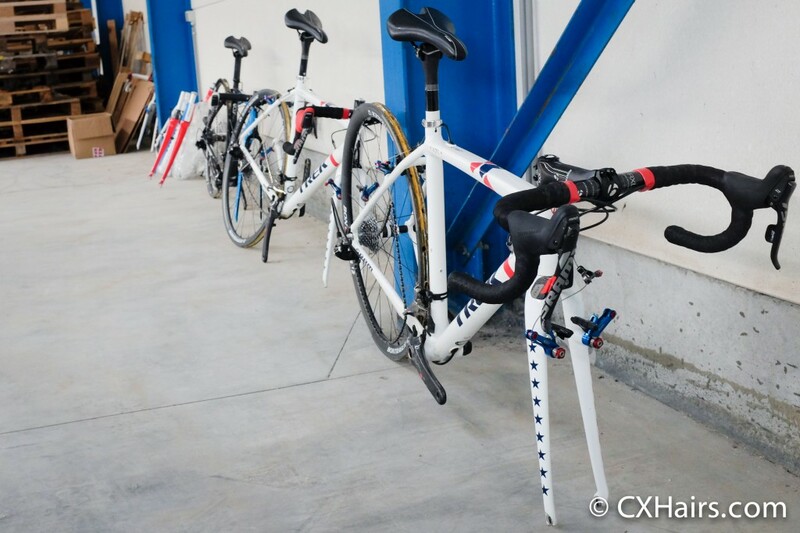 Each rider has a race bike and backup race bike, race TT bike and back-up race TT bike. They also have a home bike. 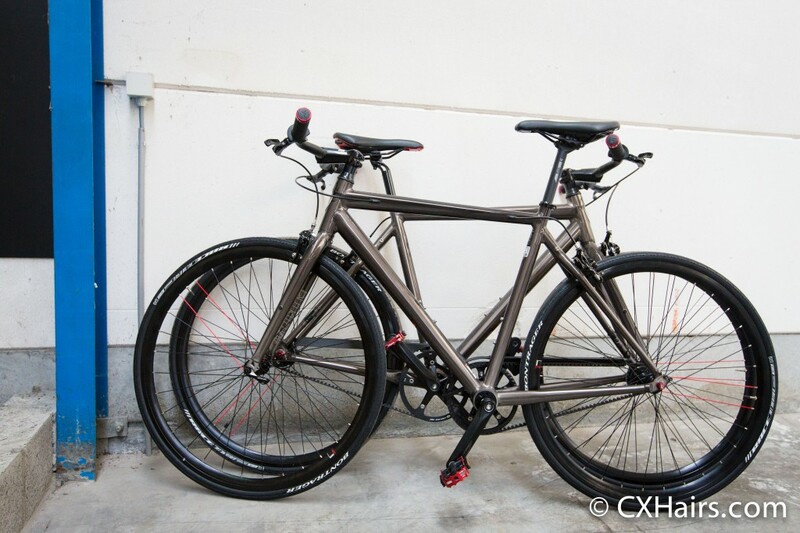 If the rider uses both a Madone and a Domane, they will have one of each at home. The bins under the frames are where rain bags and TT helmets and other items would go so mechanics can grab everything at the same time to put on the truck. As many wheels as were in the building at the time it is nothing compared to the full allotment. With three racing programs going on at the same time, the trucks are full of multiple wheel options for each rider. Aeolus 3, 5, 7 and 9 wheels depending on rider preference and type of race are on the ready. Right now all riders are on tried and true frames: Domanes and Madones. Nobody racing is on a prototype frame at this time. Or so we were told. Frames and wheels. Lots of TT rigs and hoops on hand since those bikes were not being raced the week during our visit. Even half empty, this room is amazing. 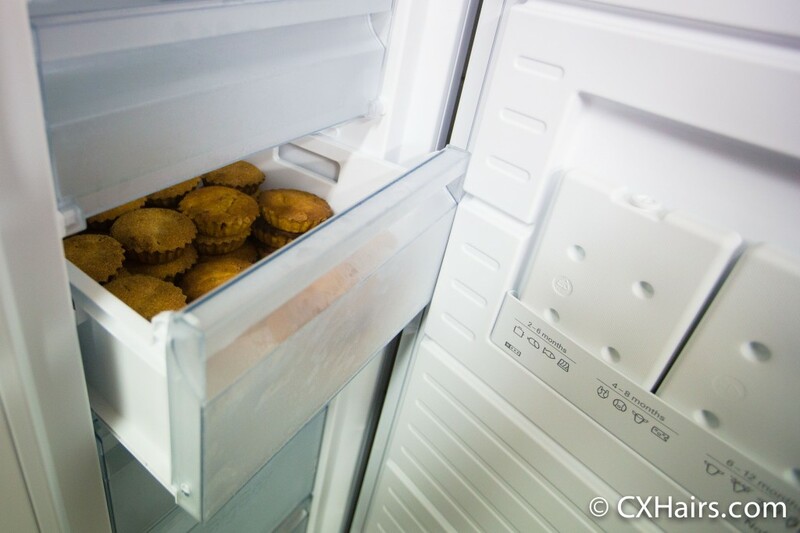 The food room is chock full of race nutrition and treats. A local baker makes cakes and delivers to the service course for delivery to the soigneurs. Buckets of massage cream, gels, drink powders line the walls. 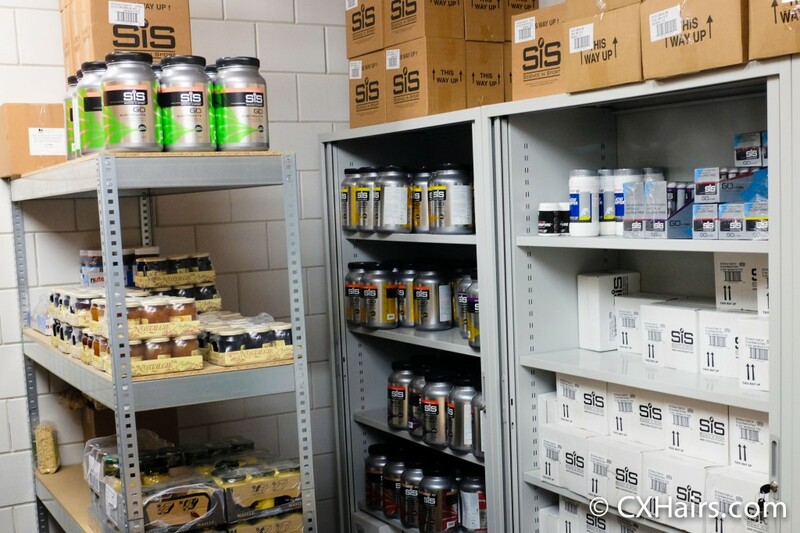 Instead of having soigneurs going grocery shopping at each race, the service course buys in bulk all of the non-perishable goods for the year. A year’s worth of race fuel sits next to food items stocked so team staff doesn’t have to buy on the road. Freshly baked goodies delivered to the service course by a local baker. The service course also has a large workshop where at least one and up to three mechanics on site every day. The day before we arrived, stacks of tubulars for Roubaix were glued to wheels and transported to the truck for the race. Riders like Jasper Stuyven and Stijn Devolder, who live not too far away from the service course, have taken advantage of the location knowing that there are mechanics available to work on their bikes whenever they need them. But other than that, the facility does not get many, if any, visits from riders. 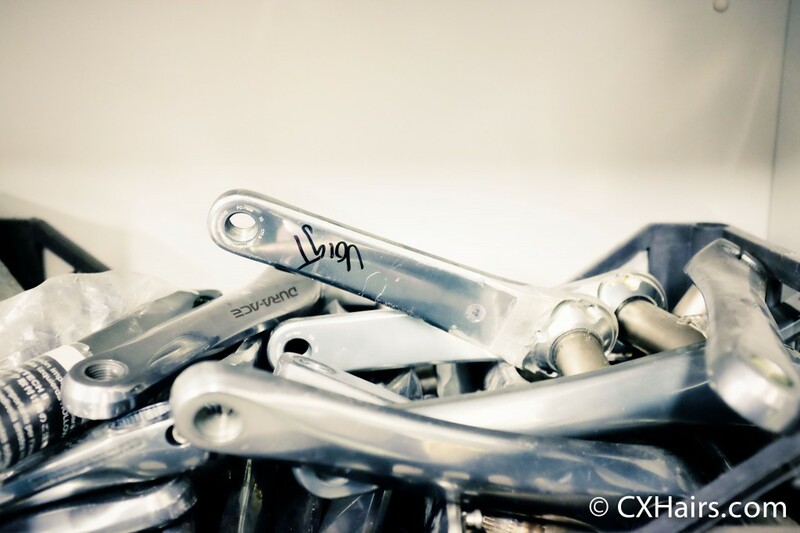 Saddles, bearings, handlebars are a small selection of the number of parts on hand to build and maintain hundreds of bikes during the course of the year. The used parts bin had some interesting bits. The unfinished side is where the twelve cars, two sprinter vans and two busses park when not at races. In the meantime it also has several boxes of old Trek-Leopard frames and other curiosities being sent back to Trek headquarters in Waterloo, Wisconsin. 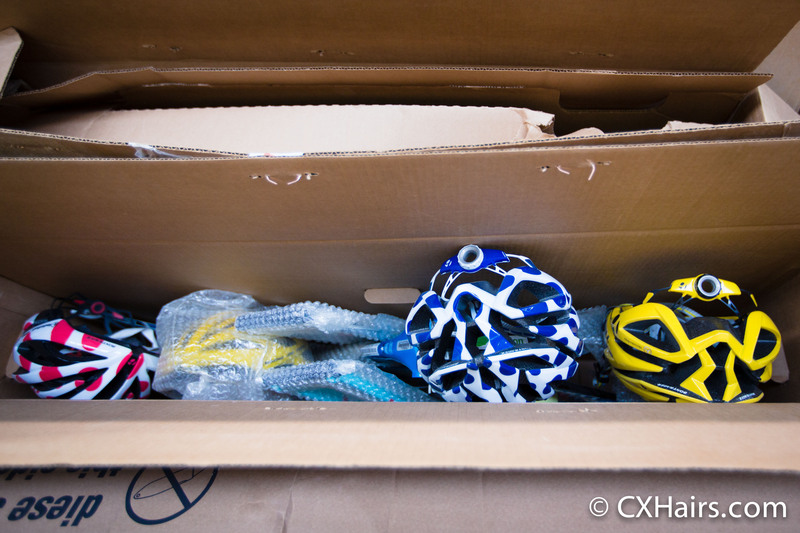 Also on hand were some pretty cool looking World Cup winning cyclocross bikes waiting to be shipped to Colorado for Katie Compton. An old frame and leftover leaders’ helmets from a past Tour de France. Crocketts and a Boone belonging to Katie Compton were dropped off for shipping back to the United States. 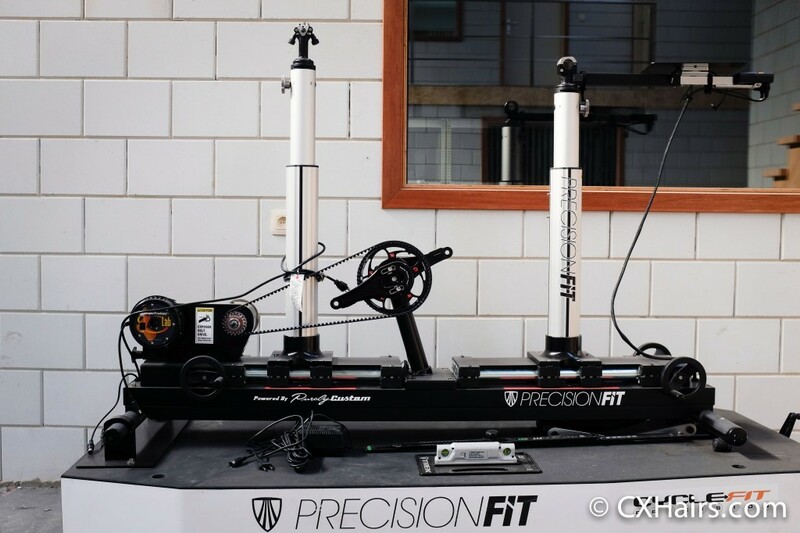 Without a performance lab on site, this precision fit machine is transported to other locations as needed. Stouffer doesn’t attend many races because his job as operations manager is to be a point of contact and problem solver for anything that may go wrong during the race. And for that he needs to be on-site at the service course. He did take advantage of his proximity to the Ronde course and spent the day in a team car handing out bottles and wheels as needed. 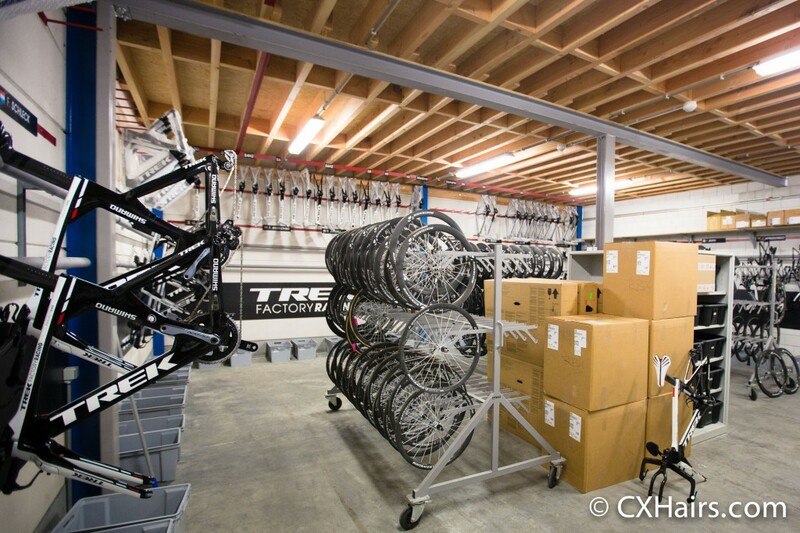 As the sole owner of TFR, Trek’s long-term goal for the team and the service course is to have a central hub with a large operation that can facilitate not only the road team but also the Trek Factory Racing MTB team and the Trek Cyclocross Collective. Down the road, the plan is to have an in-house performance lab and retail space. When that takes place it will happen at a location more easily accessible by the public.